"The vibrant colors of this salad just scream summertime! It is the perfect dish for those lazy backyard dinners. It's great as a side dish or a vegetarian main course." Place jalapeno pepper and pineapple in the hot grill; grill, turning occasionally, until pineapple has grill marks and jalapeno pepper is charred, 5 to 7 minutes. Remove from grill. Place corn and halloumi cheese on the hot grill. Cook cheese until browned on the bottom, 1 to 3 minutes; flip and cook until browned, 1 to 3 minutes more. Remove cheese from grill. Continue cooking corn, turning occasionally, until roasted on all sides, about 10 minutes; remove from grill. Place asparagus on the grill and cook until slightly charred, 5 to 7 minutes; remove from grill. Cut pineapple slices into quarters and remove cores. Chop pineapple, asparagus, and halloumi cheese into bite-size pieces and place in a bowl. Add black beans, red bell pepper, and red onion and toss until salad is mixed. Place corn cob in a large bowl and holding the top, slice halfway down to remove kernels from cob. Go all the way around the cob and turn upside down to cut the remaining kernels. Repeat with remaining cobs. Add corn to the salad. Remove the stem and charred skin from jalapeno pepper and place jalapeno in a blender. Add tomatoes, lemon juice, lime juice, olive oil, honey, garlic, and salt; blend until dressing is smooth. Pour dressing over salad; toss and refrigerate until flavors blend, about 1 hour. 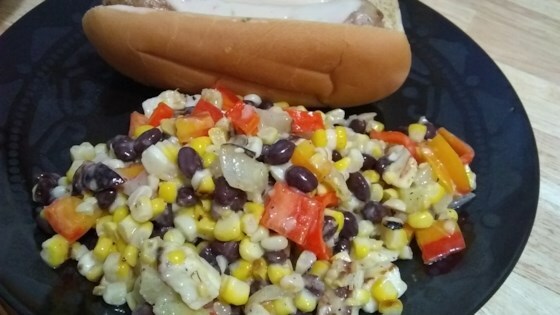 Delicious summer salad with corn and vegetables. I like to serve this salad with wheat meat "chicken" marinated in Spicy Plum Sauce over steamed Basmati rice. Add some garlic bread and an ice cold beer for the perfect summer meal! Halloumi cheese is an imported goat and sheep milks cheese made in Cyprus, Greece. It is sold in most upscale markets but you can also order it online.